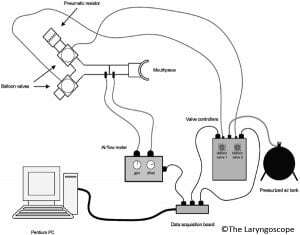 The laryngeal physiology lab not only conducts basic science research, but also contributes to the advancement of technologies for ears, nose and throat (ENT) medicine. These technologies include development of devices to treat and evaluate disorders, and parameters that measure physiological function and diagnose disorders. Below is a sample of our contributions to medical ENT technologies. 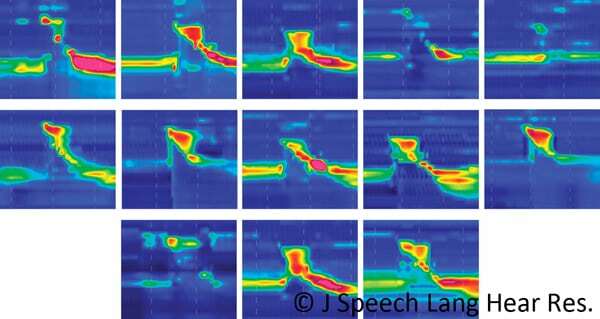 Classification models, including the artificial neural networks (ANNs) multilayer perceptron (MLP) and learning vector quantization (LVQ), as well as support vector machines (SVM), were evaluated for their ability to identify disordered swallowing. Data were collected from 12 control subjects and 13 subjects with swallowing disorders; for this experiment, these subjects swallowed 5-ml water boluses. Following extraction of relevant parameters, a subset of the data was used to train the models, and the remaining swallows were then independently classified by the networks. All methods produced high average classification accuracies, with MLP, SVM, and LVQ achieving accuracies of 96.44%, 91.03%, and 85.39%, respectively. When evaluating the individual contributions of each parameter and groups of parameters to the classification accuracy, parameters pertaining to the upper esophageal sphincter were most valuable. In addition, we developed an algorithm in MATLAB that can be applied to both normal and disordered swallowing to automatically extract a wide array of measurements from the spatiotemporal plots produced by high-resolution manometry (HRM) of the pharyngeal swallow. The algorithm was developed from data from 12 normal and 3 disordered subjects swallowing 5-ml water boluses. Automated extraction was compared to manual extraction for a subset of seven normal and the three disordered subjects to evaluate algorithm accuracy. Area and line integrals, pressure wave velocity, and pressure gradients during upper esophageal sphincter opening were also measured. Automated extraction showed strong correlations with manual extraction, producing high correlation coefficients in both normal and disordered subjects for maximum velopharyngeal pressure and maximum tongue base pressure. Timing data were also strongly correlated for all variables, including velopharyngeal pressure duration, tongue base pressure duration, and total swallow duration. Preliminary descriptive data on area and line integrals are presented. Our results indicate that the algorithm can effectively extract data automatically from HRMspatiotemporal plots. The efficiency of the algorithm makes it a valuable tool to supplement clinical and research use of HRM. We present the adjustable balloon implant (ABI), a novel implant to be used in type I thyroplasty for the treatment of vocal fold paralysis. The ABI offers the same medialization provided by other implants, but can easily be catered to individual patient anatomy as well as modified postoperatively without the need for a revision thyroplasty. A round balloon with diameter of 12 mm and wall thickness of 0.5 mm was connected via tubing to a luer slip one-way check valve on an implant manufactured by Hood Laboratories (Pembrooke, MA.) The tubing had an outside diameter of 1.5 mm. Both the balloon and tubing were made using 50 durometer medical grade silicone. The implant was placed lateral to the thyroarytenoid muscle and secured inside the larynx using an aluminum frame. Although aluminum was used in the preliminary study on excised canine larynges, the frame would be manufactured from titanium if the implant were applied to human patients. Superior and inferior flanges prevented extrusion of the implant while lateral flanges with holes allowed the frame to be sutured to the thyroid lamina. 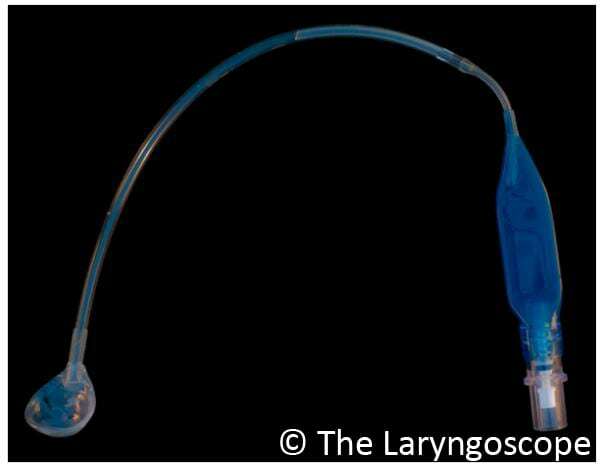 A balloon with maximum volume of 1.5 cc was used for all excised canine larynges. The selected size was based on knowledge of volume required for effective injection laryngoplasty, with added volume to compensate for the manipulations to the larynx made when creating the thyroplasty window. A main advantage of the ABI is that the size of the balloon is not as important as the volume of saline injected into it. Although only one implant was used in this study, it worked for a variety of larynges. The amount of saline injected depended upon the size of the larynx and width of the glottal gap. Saline was injected into the balloon via a luer slip syringe until the paralyzed fold approximated the normal fold. Fine adjustments were then made according to perceptual analysis of vocal quality and quantitative analysis of threshold aerodynamics. Care was taken to avoid overinjection and resultant balloon bulging. If bulging was observed, saline was removed until an optimal volume was reached. Excised dog larynx with balloon filled with 1.2 cc saline. 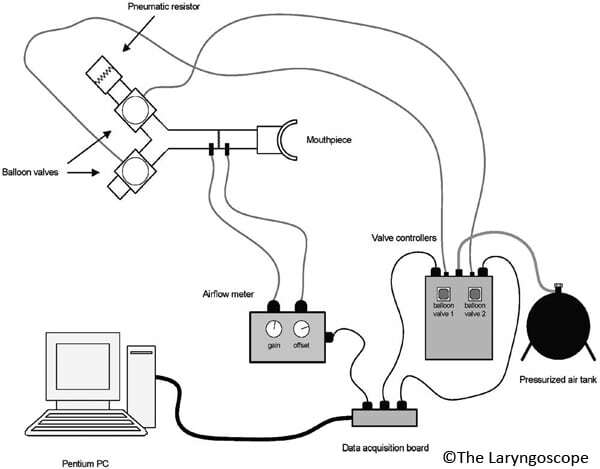 Kymograms from one larynx for the three experimental conditions: normal (A); simulated vocal fold paralysis (B); and the adjustable balloon implant ©. Unilateral vocal fold paralysis (VFP) was modeled in five excised canine larynges. Medialization laryngoplasty (ML) was performed, followed by AA. The optimal degree of arytenoid rotation was determined using real-time measurements of vocal efficiency (V(E) ), percent jitter, and percent shimmer. After the optimal degree of rotation was determined, the arytenoid was hypo- and hyperrotated 10% ± 2% of the optimal angle to mimic hypoadducted and hyperadducted states. Aerodynamic, acoustic, and mucosal wave measurements were recorded. Mean optimal angle of arytenoid adduction was 151.4 +/- 2.5. The arytenoid was then hypo- and hyperrotated to mean angles of 161.6 +/- 11.2 and 143.4 +/ 13.5, respectively. Optimal AA was found to greatly improve percent jitter and shimmer when compared to other treatments (ML, hypo-AA, hyper-AA). Using real-time voice analysis may aid surgeons in determining the optimal degree of arytenoid rotation when performing AA. We expanded upon recently introduced teaching paradigms in laryngology by developing a model for laryngeal education that was readily available, inexpensive, and provided an experience similar to in vivo human laryngeal surgery. A temporal bone lab was modified into a laryngeal dissection lab with minimal changes. Canine larynges were found to strongly resemble human larynges and were easily used in a teaching model. They were more easily acquired and less expensive than human larynges. A novel dissection approach was created to maximize utility of a single cadaveric laryngeal specimen. A laryngeal dissection course with specific teaching objectives was formulated, which led to the creation of a laryngeal dissection manual. The mucosal wave is a property of vocal fold vibration characterized by the alternating mediolateral motion of the upper and lower vocal fold lips. Subglottal pressure against the lower vocal fold lips causes them to open and move laterally, and when the pressure continues upward, the upper vocal fold lips open. 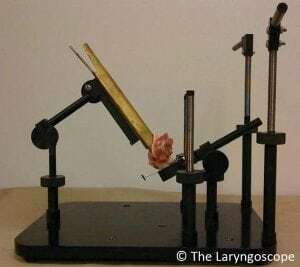 The decrease in pressure in the subglottal space following the vertical release of air during the opening of the upper vocal fold lips pulls the lower vocal fold lips closed in the medial direction. 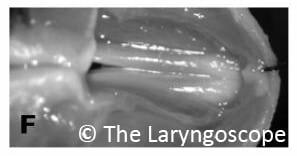 This is followed by the closing of the upper vocal fold lips as well (Krausert et al., 2010). These successive movements of the upper and lower vocal folds are facilitated by the pliability of the mucosal epithelium and upper lamina propria, and they resemble a vertically traveling wave. Thus, this feature of vocal fold vibration is termed the mucosal wave. VKG, a line-scan imaging technique, has proven to be an effective method for studying vocal fold vibratory patterns. 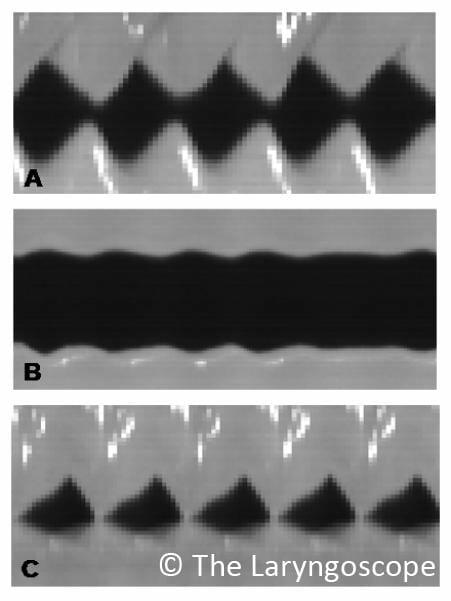 We used VKG images and an automatic mucosal wave extraction method to examine the vibration of each individual vocal fold lip of 17 excised canine larynges under differing subglottal pressures and line-scan positions. This allows for easy determination of four sets of vibratory parameters, and examination of the effect of biomechanical parameters on vocal fold vibrations. Recently, airflow interruption methods have shown the most promise as simple, noninvasive techniques to estimate SGP. Our previous airflow interruption system did not estimate SGP during phonation but during a period just after phonation ceased. Studies have suggested that estimating SGP at the moment phonation ceases may not represent the true value of SGP as it exists during normal phonation. In addition, completely blocking airflow during phonation (especially at higher intensity levels) might be a disruptive stimulus, potentially inducing inadvertent changes in subject phonation and glottal configuration. We developed a new noninvasive method to estimate SGP that was less disruptive and did not completely interrupt phonation. Using incomplete airflow interruption by way of supraglottal impedance (pneumatic resistors), we estimated SGP(cmH2O) from measured airflow (L/s) and known supraglottal impedances (cmH2O/L/s) by applying the predictable relationships between pressure, flow, and resistance. “Chaos” is a term that describes pseudorandom behavior generated by a system that is both deterministic and nonlinear. Although chaos was once thought to be unique, it has now been widely observed, such as in turbulence, chemical reactions, nonlinear circuits, the solar system, and biological populations. Studies in neurology and cardiology suggest that chaotic activity is an important aspect of physiologic systems. Methods based on nonlinear dynamics, including general dimension (Hausdorff dimension, information dimension, correlation dimension, etc. ), entropy (Kolmogrov entropy, second-order entropy, etc. ), and Lyapunov exponents, enable us to quantitatively describe chaotic behavior. Chaos theory and nonlinear dynamics can enhance our understanding and therefore our assessment of pathological phonation. 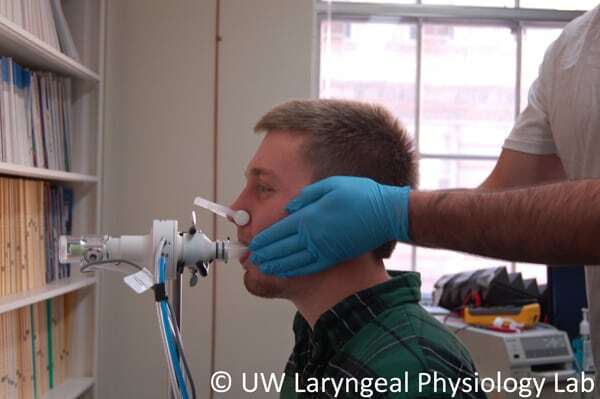 Phonation threshold pressure (PTP) is theoretically defined as the minimum subglottal pressure (SGP) that is necessary to sustain phonation for a given laryngeal configuration. Mathematical models and animal studies predict that PTP should be increased when phonation is abnormal due to vocal fold disease. A measure of PTP might therefore provide a useful measure of the ease with which phonation is produced, and such a measure might be clinically useful in the evaluation of clinical voice disorders. We developed an airflow interruption system to allow noninvasive estimation of PTP at different levels of vocal intensity. Subjects sustain a constant tone and the airflow is directed into a section of pipe with an airtight mask over the mouth and nose. The airflow, intramask pressure, and intensity of the acoustic output are recorded. A PTP is predicted from a difference between an estimate of the subglottal pressure and the vocal tract pressure at the point that phonation ceased after interruption of airflow.